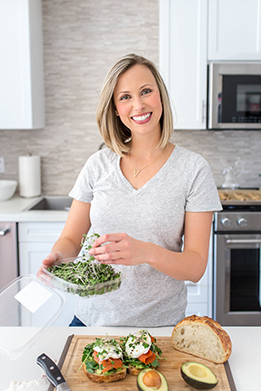 Tomatillo salsa is one of my favorite foods, so it is fitting I have a recipe for it on my site! I am pretty sure I will (and likely have) put it on everything. My favorite is scrambled eggs or as a topping in my breakfast burritos, but this easy tomatillo salsa is so good, I could practically eat it with a spoon! Tomatillos are nightshades, just like tomatoes, peppers, eggplants, and potatoes. You’ve probably seen them next to the other peppers in the vegetable section. They look like green, unripe tomatoes with a dry, leafy husk around the outside. The color of the fruit is a beautiful bright green, with a firm flesh. When choosing tomatillos in the store, look for green husks. They should NOT be yellow, brown, or damaged. Tomatillos are slightly more acidic and tangy, and less sweet than tomatoes, but roasting them brings out their natural sweetness and depth of flavor. 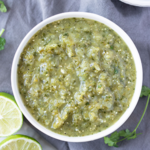 I have tried a lot of tomatillo salsa recipes that used a few different kinds of chilis but I ultimately found that the fewer and simpler the ingredients, the better. I roast fresh tomatillos, jalapeño peppers, garlic, and white onion before adding them to my food processor with fresh lime juice, cilantro, salt and pepper. That’s it! 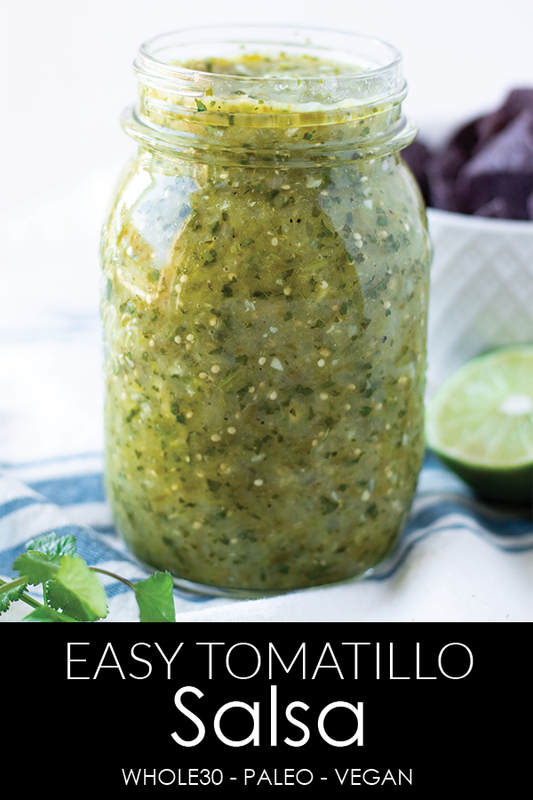 You’re left with a delightfully bright green, easy tomatillo salsa! If you’re feeling ambitious and want to explore another homemade salsa, check out my homemade pico de gallo recipe as well! 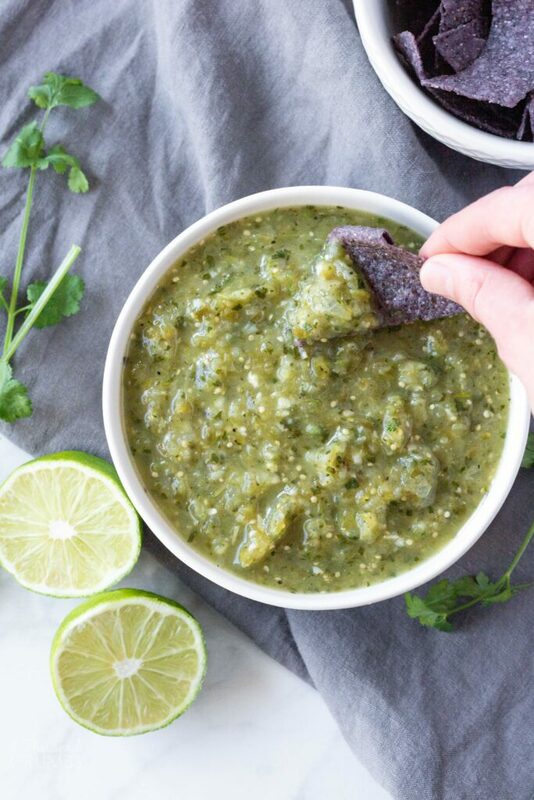 Green tomatillo salsa is great on just about anything. It makes a fantastic snack, a wonderful topping on eggs, and an absolutely necessary addition to taco night. Pre-heat your oven to 425F degrees. Line a rimmed baking sheet with aluminum foil, set aside. Peel the papery husks off the tomatillos. The tomatillos will have a sticky residue on them. Thoroughly wash them with dish soap and rinse well. You can also plunge them into boiling water for 90 seconds and then transfer them to an ice bath (to stop from cooking). Add tomatillos, jalapenos, onion and garlic cloves to your baking sheet. Drizzle with avocado oil and toss to coat evenly. Roast the veggies for 20 minutes. You don’t want the veggies to burn, just turn a beautiful golden color. Remove from the oven and let cool completely. Using a blender or food processor, add the cooled veggies, cilantro, lime juice, salt, pepper. Pulse to break everything up, and then process for 5-10 seconds at a time until you reach desired consistency. Taste, and add more lime juice, salt or pepper, as needed.